Advertising in China is digital nowadays. Brands in China are spending 65% of their budget online in 2017. This is the most complete, accurate and BS-free Guide about Advertising in China you will ever find. Our clients like us, are results-driven. We created this resource as a starting point for them. Which means before the information you will find on this page were confidential. We did so because of the awful number of clients who came to find us after wasting thousands of dollars in ineffective (if not borderline scammy) advertising campaign with local agencies. More often than not “recommended” by their local partners. First, What kind of advertising you CAN do in China. It is a very different world than the US or Europe. Second, What kind of advertising you SHOULD do. Spend your money where you will find the best Return on Investment. And only there at first. 3.1 What are the main benefits of Weibo Ads? 3.2 Weibo the number one for E-Commerce? 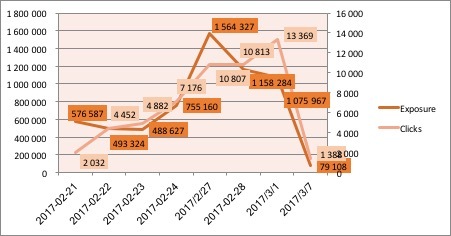 3.4 How Consumers Use Weibo? 4.2 In-Feed Ads in Chinese News Apps? Despite the general economic slowdown in China, the online sector is showing no signs of abating with high revenue spend & innovation still defining features of the Chinese digital eco-system. Indeed digital ad spent in China reached $40.42 bn in 2016, a 30% increase on the previous years spent. Ad spent in China is expected to reach over $80 bn by 2020. The numbers speak for themselves, this is a lucrative arena in terms of spend and ROI. Advertising in China is a very unique eco-system that requires a different approach, understanding and the mind-set. The reach of targeted adverts based on ROI & cost for implementation (per clicks/mille/impressions) is the priority. This should also be coupled with an understanding of the demographic on key Chinese platforms. China’s shift from traditional to digital media is also reflected in declining spend on TV and print. In 2016, TV spend accounted for 24.2% of total media ad spending, or $18.92 billion. That’s less than half of digitals share. Meanwhile, print spend accounted for an unimpressive 7.0% of media spend, or $5.50 billion. Mobile is on course to become the leading ad spending channel in China, according to GMA’s latest forecast. By 2021, almost 60% of total media ad expenditures and close to 84% of digital ad spending will be dedicated to mobile. The growth in mobile ad spending in China has been propelled by the BAT companies—Baidu, Alibaba and Tencent—which combined will take in nearly 72% of all mobile ad expenditures in China this year. It’s a given in China that content has to be optimized for mobile with +550 million smartphone users accessing content ‘on the go’. 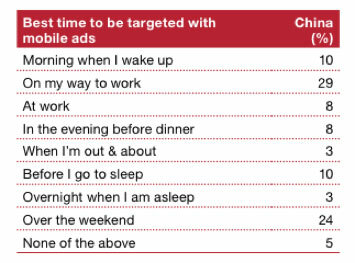 A survey by Jing Daily on the best times to be targeted with mobile ads, note whilst travelling to work is the best time. The dominant platforms are built for mobile in China, this is no coincidence..
Users engage with ad content differently, they are ‘on the go’ and will often impulsively click through on ads if deemed to be relevant to them. Mobile leads to more time online and a greater exposure to your content, more interactions, more targeted ad opportunity. We are a purely digital & international team of 42 based in Shanghai, a large part of implementing any digital campaign is ad budget allocation but you can’t simply ‘stick money on ads’ & just expect results in such a complex marketplace. CPC/CPM researched (Cost Per Click + Cost Per Mille). Baidu is a powerful portal with 70% of the Chinese search engine market. Baidu is akin to ‘China’s Google’ and from our perspective a vital element of any serious campaign. Indeed 75% of all first stage research is conducted via this engine. All Baidu ads start with Chinese Character keyword searches. The main plus is that you can assess the number of searches on specific search terms for a better indication of traffic levels prior to campaign launch. On Baidu (unlike Google) DSP/Media Banner ads are not typically used, the majority of all advertising is PPC. Why? Because Baidu are yet to develop this infrastructure. PPC search results are also perceived differently in China with more trust in paid search than typically in the West. One reason for this is the pre-dominance of PPC throughout the development of the Baidu platform with most Chinese digital players more aggressively monetizing. 2 Lines of Ad Copywriting (although often only 1 will typically show, depending on ad placement). There are some limitations when it comes to Baidu ads for health and pharmaceutical products to ensure you speak with a specialist first. The effectiveness of PPC depends on the sector, often either high-value investments or relatively low scale purchases will thrive on Baidu PPC (e.g. Real Estate & FMCG). Cosmetics are also typically associated with Baidu PPC. Baidu PPC links at the top/right of the search results. Baidu’s traffic is all search based, you tend to have a very qualified set of users who seek to research for information extensively. PPC is one part of reaching out to this audience whilst SEO (optimization in the natural search results) also plays a strong role in Baidu success. 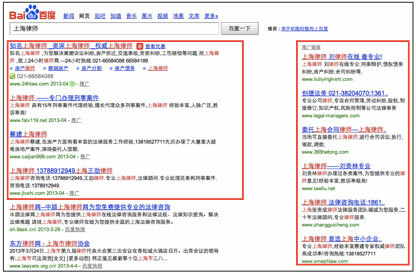 To apply for PPC advertising you need to submit a series of documents to Baidu for site verification, authorization prior to PPC advertising is required. A copy of your company chop/seal applied to documents (see below for example). Weibo now boasts 600 million users with 350 monthly active accounts, it would be disservice to merely label Weibo as the ‘Twitter of China’ (although the name literally means Micro Blog). Rather this is an innovative platform that is tailoring itself to E-Commerce marketing options more effective than the bulk of its competitors. 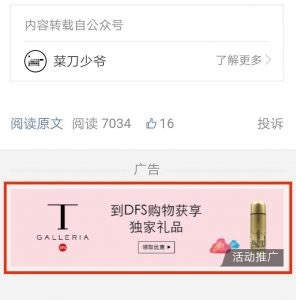 Weibo as a platform for advertising is really growing in caliber. Why? Alibaba (China’s largest e-commerce giants) now own 35% of China’s second largest social network. In terms of its functionality, Weibo is akin to Twitter with micro posts, a hashtag functionality and content/video links making up the majority of posted content. In terms of advertising infrastructure, it is more akin to Facebook than any of its rivals and it arguably a better platform for ad spend than WeChat, it’s key rival. We worked extensively with Only Lyon to build their account through targeted ads. They now have over 280,000 followers. What are the main benefits of Weibo Ads? Weibo the number one for E-Commerce? With their lucrative partnership with Alibaba in mind, it’s important to consider the implications for E-Commerce ads. Alibaba owns the flagship and largest stores, Tmall & Taobao. External links to alternative E-Commerce stores are now being limited from Weibo whilst the platform is set to receive a large investment. Consider if you are an E-Commerce player to focus on Weibo with it’s connections to China’s e-retailing giant. Fan tunnels are the most targeted and intelligent way of reaching new consumers & followers. You can use this to promote either a specific post or your account. It functions like a ‘headline’ that appears at the top of a user’s news feed. Why so effective? For new brands that don’t already have a large following, this is the best way to build one, Fan Tunnels focus on the whole of the Weibo community, not just existing followers. It will place your content at the top of news feeds based on targeted audiences defined by age, gender, region, interests and even device types. You can specify the interests of followers & target other accounts for similar niches. You can select users who follow specific fashion news & fashion related posts to be targeted (for example). Costs for Fan Tunnels is typically calculated in CPM (Cost Per Mille), pricing starts from 5 RMB per 1000 exposures. A promoted fan tunnel post below in the users feed. Note that the account has been verified by the blue V.
Display ads are traditional but certainly still effective, ‘if it ain’t broke don’t fix it’. Display ads come in various dimensions on different pages. They are optimized for both the mobile and web version (although mobile is pre-dominantly used). When users click on the ads they are directed to an advertiser’s homepage. Pricing depends on page placement, size and keyword association. Weibo allows for a targeted approach here with keywords selected for visibility based on user searches, you can also feature displays on other relevant accounts that boast followers in the same niche. 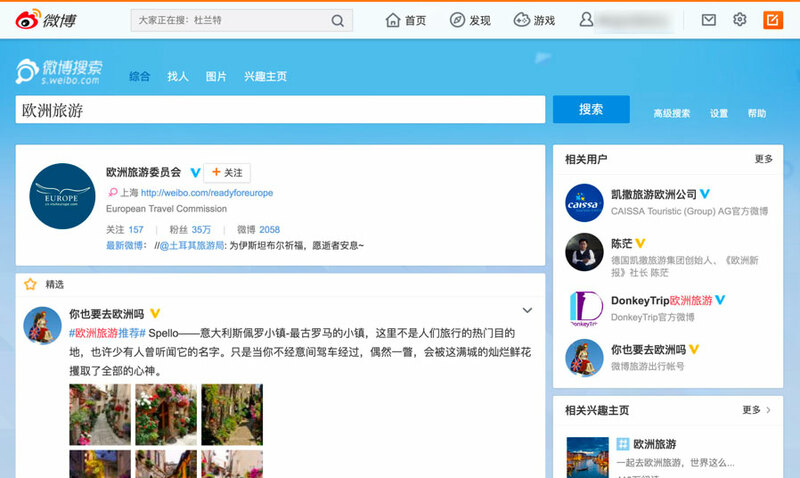 Display ads are mainly placed on the search page (in the discover section), on the Weibo homepage as well as on the side of user’s news feeds (akin to Facebook Ads). An example display ad placed at the top of a Weibo page. Weibo users are typically younger with 68% of the user base between 15-30. This is important to bear in mind with your brand & product placement. Weibo also is a highly active and animated community. Users expect a high level of engagement/quicker response times, one reason for this is this is a platform dominated by KOLs, paid ads are one thing but capturing the attention of expectant Chinese consumers with an active account is another. News applications have a 15% online market reach, they are particularly associated with high-net-worth individuals. News apps are important as sources of information with Chinese users selecting categories of news which will then appear in their ‘news feeds’. The numbers are impressive. By the end of 2016, Toutiao (the dominant player currently) had 80 million daily active users, who spent an average of 76 minutes reading the news and watching videos through the app, according to company sources. In-Feed Ads in Chinese News Apps? The benefit of using apps such as Toutiao is that you can adopt a targeted approach to reach users already browsing for news, they are by their nature an engaged audience. This ‘advertorial’ contains informational text, it’s an ad that appears alongside news in the feed for the user. Users then click on the ad to a contact form to leave their details for more information (lead gen form), eg name, email, phone number etc. This type of advertising is great because not only do you place the ad, you also create a contact form to develop a database of interested consumers/prospects. News App adverts need to be running on multiple platforms to create an ‘echo chamber’ effect. We typically work on 3-4 for our clients. A typical budget when it comes to prospect generation ranges from 25,000 RMB – 45,500 RMB. This can drive exposure levels of +1 million users. The highlighted article is an ‘Advertorial’ inserted into the News Feed. The ad itself appears amongst news-worthy content. Total Exposure of 6,191,384 & 54,919 Clicks from a previous GMA News App Campaign, contact us for more information. Official Account on News App Toutiao posted about Vancouver Fashion Week. 81,000 views and 59 comments. Official Account for DAMAC. A definitive source of information for Investors in Dubai. 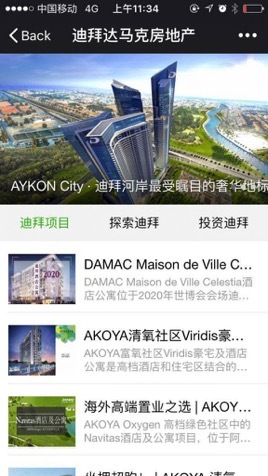 We launched a large scale WeChat Ad Campaign to drive engagement with the account. WeChat Ads are always a hot topic in China, some will preach their effectiveness whilst others are skeptical. The key is budget allocation, WeChat ads do require a higher level of initial investment than other platforms. You need to ask the question; What’s the point of WeChat ads? Largely to attract followers & engage new + existing followers. From our experience there is a magic number when it comes to WeChat, 10,000 followers serve as a Launchpad for your future growth with more re-posts, shares and an animated community engaging with your brand & business. WeChat moment ads were launched in early 2015 when 25 brands including Coco Cola and Mercedes-Benz took part into the first testing campaign. 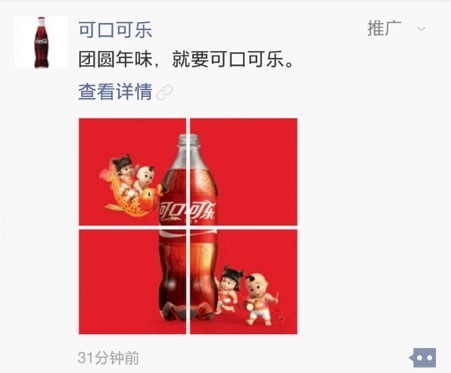 Moments ads tend to be best for brands that already have a certain level of engagement in China. You can target users according to their location, interest, age, gender, device and phone network. When it comes to the location there are three categories including Beijing & Shanghai, 35 first and second-tier cities, and non-specific cities. For small/medium companies or companies in service or B2B industry, advertising channels such as KOL, WeChat banner ads, and Tencent ads on QQ maybe a smarter choice. The starting price for moments ads is 50,000 RMB in mainland China as well as if you are targeting foreign Chinese tourists. 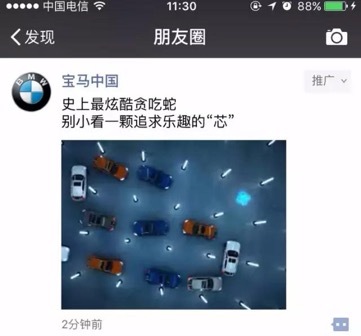 WeChat launched video moments ads, an example from BMW, this increased click through rates by 18%. The traditional WeChat Moments Ad, the 4 images were collated to form the brand image. There is another form of advertising on WeChat termed “banner advertising”. These banners are very much like the ad banners you would see on a website. 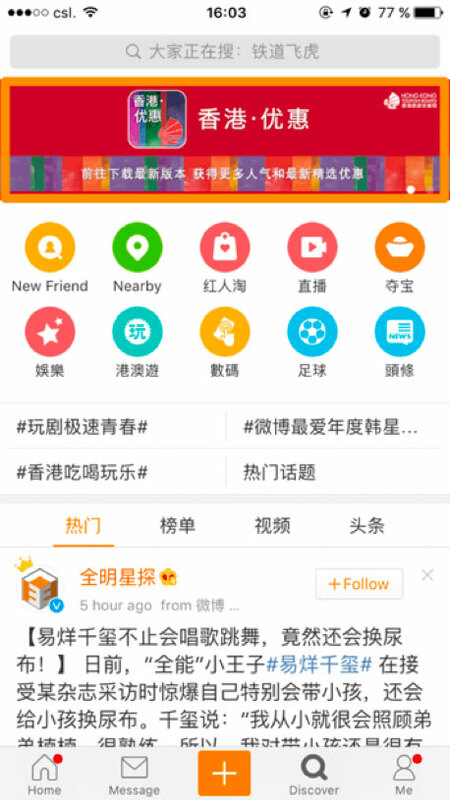 In the context of WeChat, they are featured at the bottom of a message written by a WeChat Official Account. WeChat article: WeChat banner ads appear at the bottom of a WeChat article written by another WeChat Official Account. Ad banner: the banner contains a logo, account name and headline. When clicked, it takes the users to a page containing additional information about the brand/product. Call to action; this takes users to another landing page, see below for detail. The banner ads can take drive users to follow WeChat Official Account, download an app, claim coupon code, buy a product, signup link or to a customized landing page. A banner ad placed at the bottom of an article, this is intelligent as articles can be targeted to link to your offering. WeChat banner advertising is the most typical way to grow your WeChat followers with stable ROI. It’s important to run a few test campaigns with different content to calculate the CPA. A WeChat follower cost between 8 RMB – 20 RMB depending on your targeting and how well you optimize the campaign. It’s a good method to get started on WeChat. The minimum investment in Banner ads is 50,000 RMB through the WeChat platform. The advertising eco-system in China a rich environment, you need to consult with an expert on what can be a very complex market. There are a host of options not covered here so if you have a serious project please contact our team for an in-depth consultation on developing your interests in China. This market is undeniably lucrative for companies but also fiercely competitive. The key is to find the right partner, particularly when it comes to brand reputation. Serious players need to invest in their own online growth in such a digitally orientated marketplace. We sincerely hope this guide has been insightful. We are a specialist Chinese Advertising team with 6 years experience in the Chinese market, we understand this target demographic and how to reach them. Please contact us for an in-depth discussion on how to further your interests in China.